College dining halls are known for large amounts of food thrown away by students, for grease-laden burgers and chicken nuggets and for preparing mass quantities of food straight from the freezer section that would never be considered "fresh." 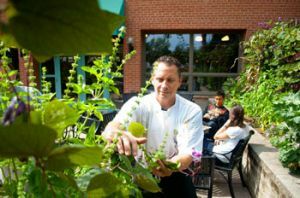 But something different is going on in the Goshen College Dining Hall, with the AVI Fresh food service provider leading the way in caring for the health and taste buds of each student and for the well-being of the earth. In 2009, when the college was choosing a new food service provider, these qualities were what set them apart.